3D Frame Analysis library is now available. A complete structural analysis library for developers. Programming library (Software Development Kit) for the structural analysis of 3d frames using finite element method. Static, dynamic loads are supported. Linear and non-linear effects are considered. 3D Frame Analysis Library is a comprehensive library that enables developers to link their applications to our solution engine for structural analysis purposes on space framed structures. The use of the library requires elementary programming skills as it can be directly called using VB .NET, c# and other programming languages. 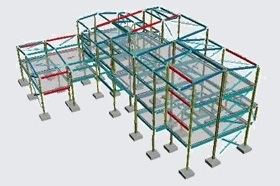 In this case, a full structural analysis application can be built, without concerning the analysis engine, since it is provided with the library.